BLD Pharm R&D center, covering an area of 19,500 square feet, is a specialized experimental chemistry site equipped with R&D rooms, synthesis lab, analysis lab and kilo lab. It runs under a strict quality control system. We use advanced chemical analysis technologies such as HPLC, GC, NMR (Bruker400MHz), LC-MS, infrared spectrophotometer or UV spectrophotometer to ensure the delivery of top quality chemicals and meet the strict requirements of our customers. The center has long term cooperation with prestigious Chinese universities and research institutes. We carry out our R&D program in collaboration with these top ranking research institutes and laboratories, such as the USST (University of Shanghai for Science and Technology) and the SIPI (Shanghai Institute of Pharmaceutical Industry). 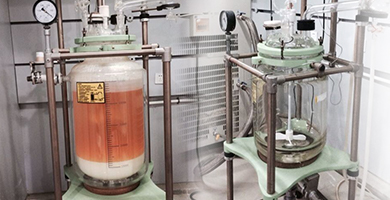 BLD Pharm R&D Center including our controlled laboratories, scientist staffs and production site ensure that our clients are provided with top quality chemicals. Since the establishment of the center, we have successfully developed hundreds of new compounds, including API, heterocyclic and benzene derivatives which have been widely used in pharmaceutical, dye, pesticide and other industries. Our sales principles are: Integrity, Responsibility and Delivering high quality products. We constantly develop new compounds to meet the growing demands of the market.